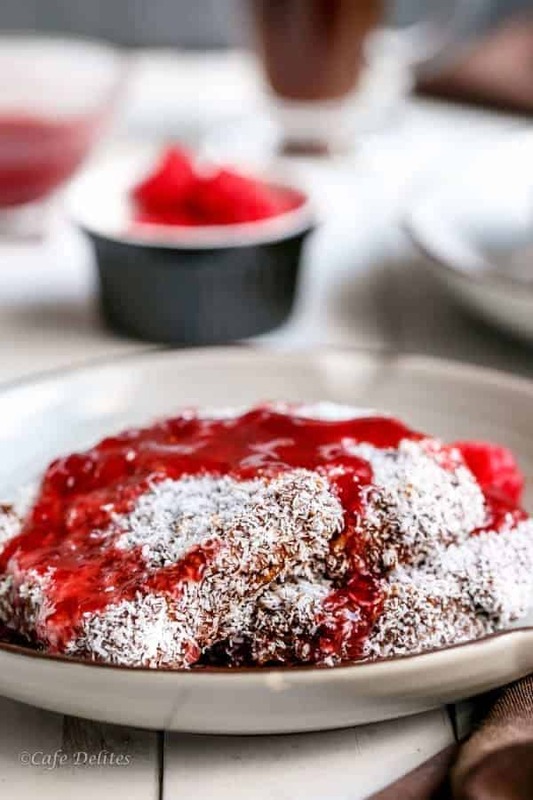 Your Australia Day breakfast is covered with our classic Australian Lamington — with a breakfast twist! 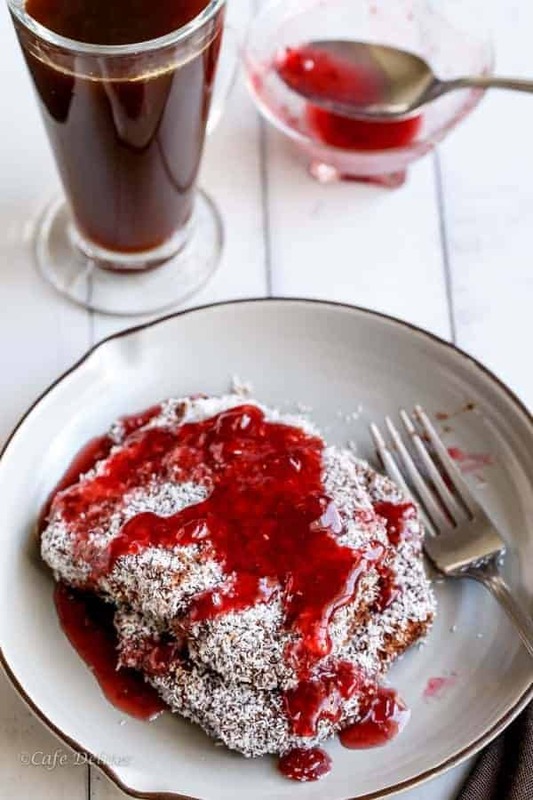 Lamington French Toasts! 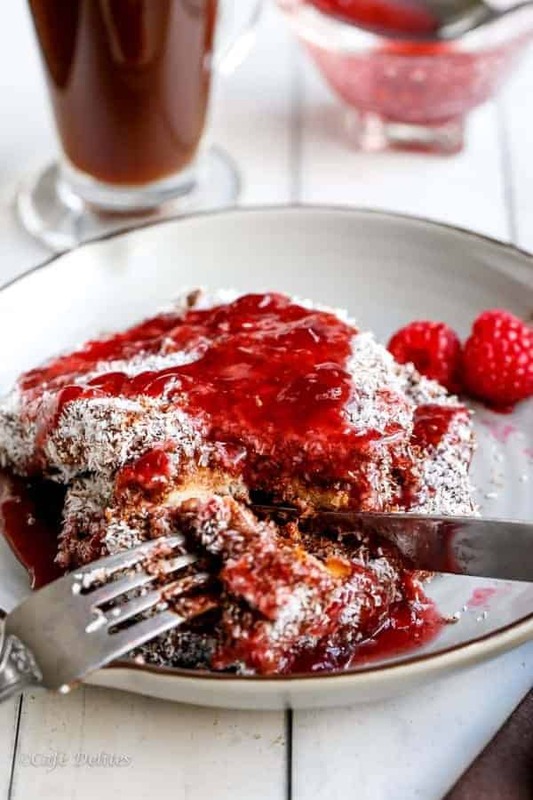 Chocolate iced French Toasts covered in finely desiccated coconut and drizzled with a raspberry jam syrup for the most decadent French Toasts….ever. 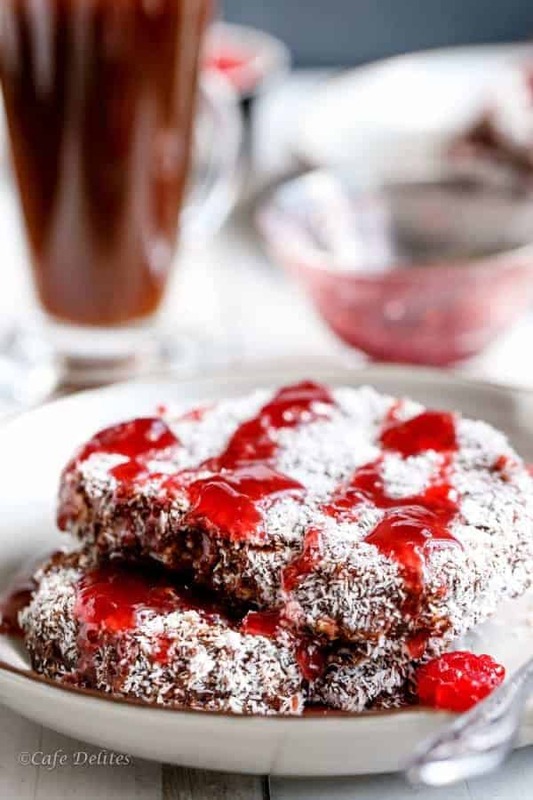 Lamingtons are beautiful cake squares covered in sweet sweet chocolate and coconut. They are a beautiful treat at tea times, for breakfast, or after any meal. And while eyeing some jam stuffed Lamingtons at the supermarket, my brains gotsta thinkin about this creation. Because starting Australia Day the Australian way – besides fried eggs, sausages and bacon on the bbq- is the only Australian thing to do. Instead of stuffing these with cream and jam (which you could totally do too), I made some jam into a syrup, and drizzled it all over them. Seriously, this is the best breakfast by far. So, the family have requested I make these again for tomorrows breakfast. Guess who’s not complaining. Yes. That would be me. This kinda looks complicated….I know. But it’s really not. 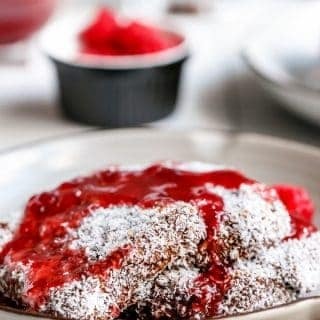 It’s a matter of turning any plain ol’ french toast with any plain ol’ bread you have lying around, (I use sourdough because I have a little love affair happening with it, but you can use any plain bread – no grains for the Lamington effect)…..
…..and turn it into an incredible way to start your day. Dunk it, dip it, drizzle it.. 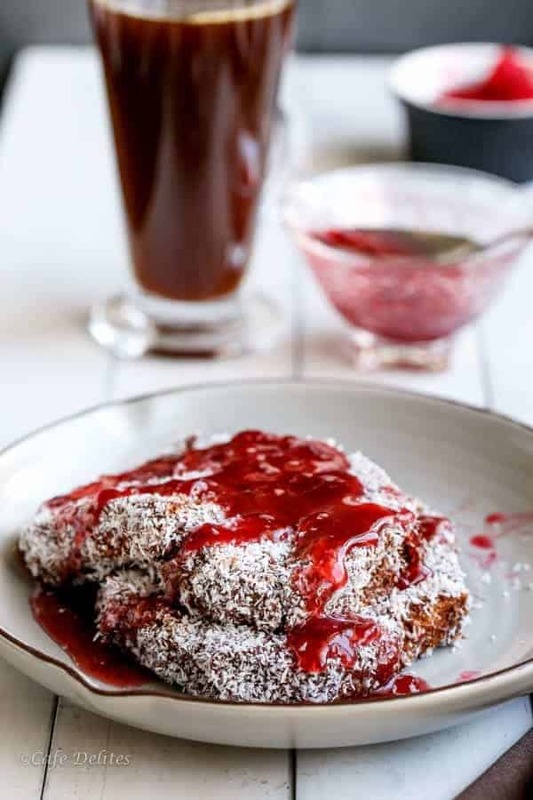 Your Australia Day breakfast is covered with our classic Australian Lamington -- with a breakfast twist! 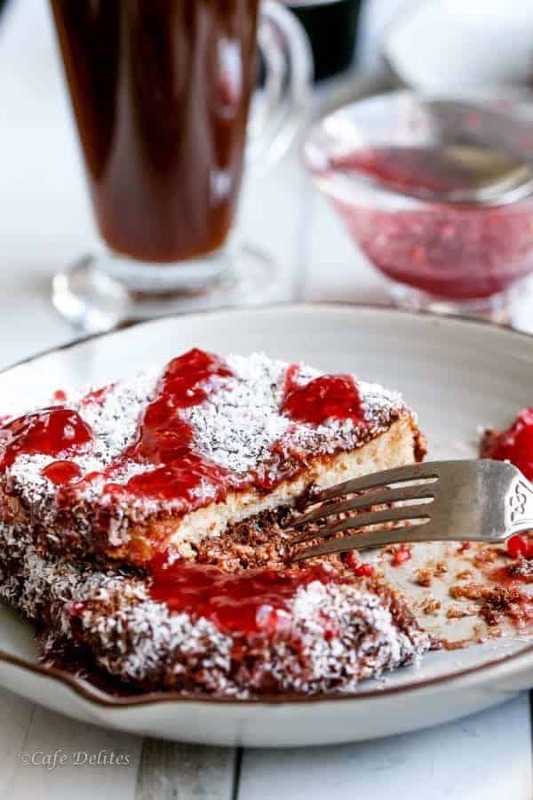 Lamington French Toasts! 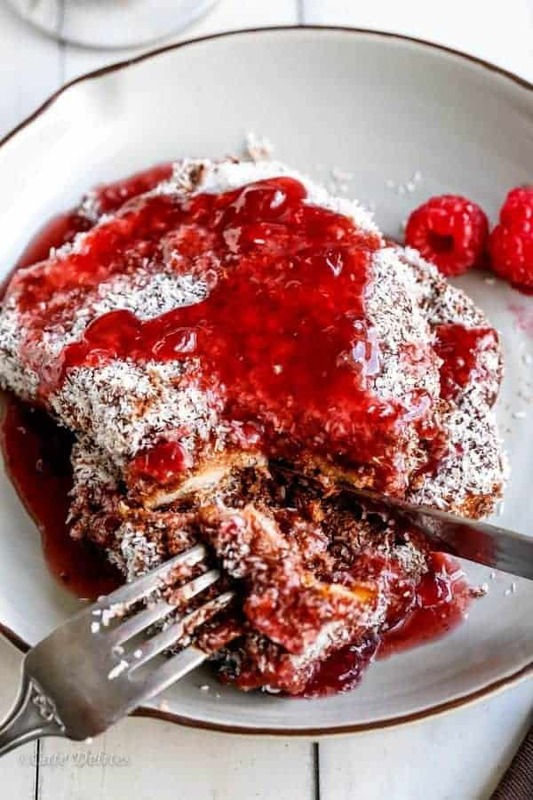 Chocolate iced French Toasts covered in finely desiccated coconut for the most decadent French Toasts....ever. Whisk together the eggs and milk in a wide shallow dish. Add one piece of bread at a time to soak in the egg mix, then place in a lightly buttered preheated frying pan/skillet. Fry until golden on each side and cooked through. Repeat with each bread slice. Make the Chocolate Icing; in another shallow dish, whisk together the icing sugar and cocoa powder. Add the warm/boiling water and mix until a thick chocolate sauce-like icing forms. Make the Jam Syrup; combine the jam and water in a serving jug, and whisk until a syrup forms. 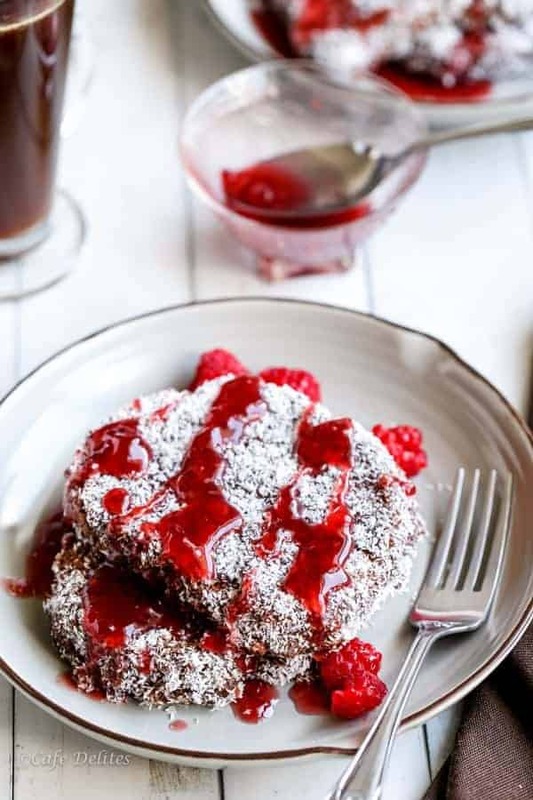 To serve: drizzle the jam syrup over the top to serve! This does look truly decadent. 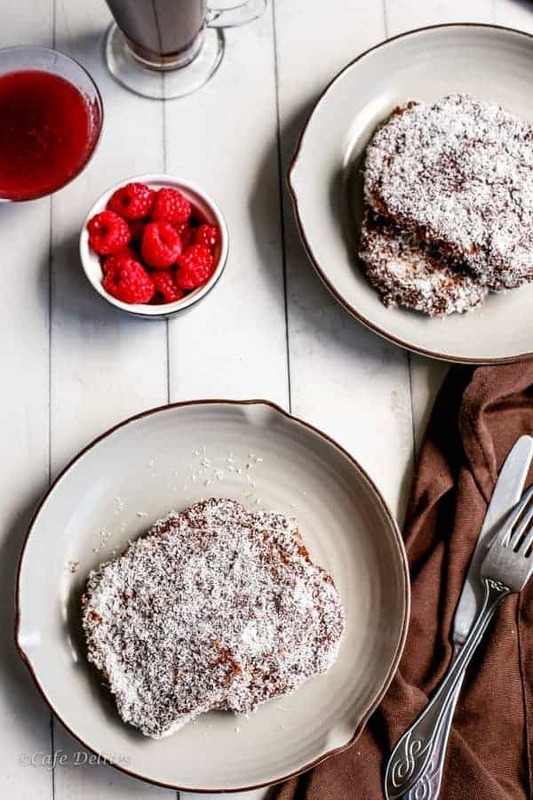 I love how you enveloped the french toast in coconut. 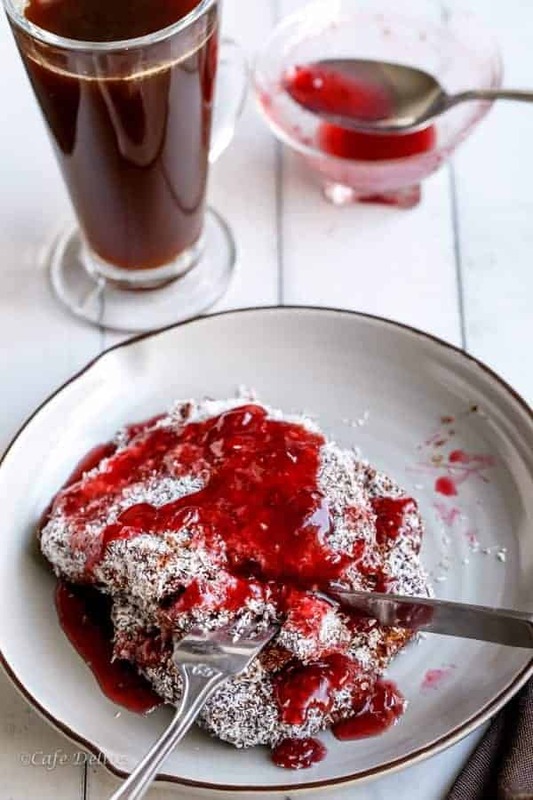 The coconut, chocolate and berry syrup would certainly have my taste buds dancing. haha what a terrific idea! Certainly not one I’ve ever seen before! The perfect breakfast for Australia Day, in my opinion! My sister and I made white chocolate lamingtons yesterday, with a mango & lime curd filling. We were so impressed with how they turned out! Yummy! 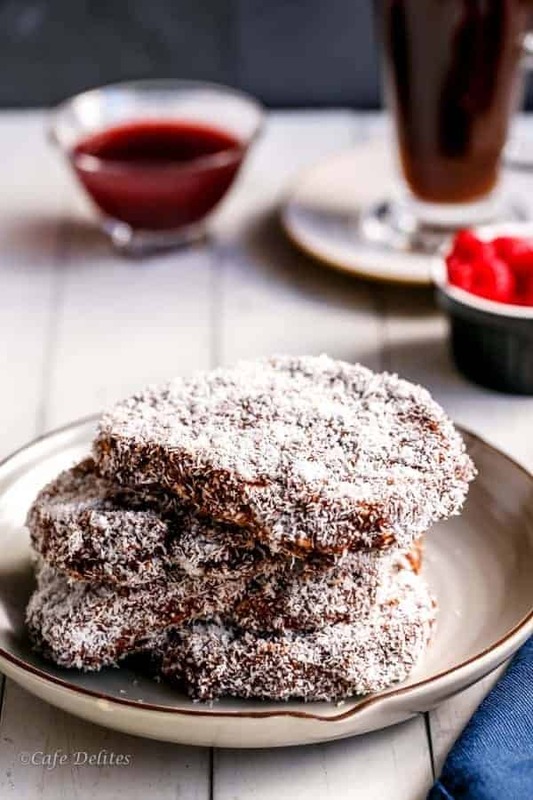 Do you have a recipe or link for homemade Lamington that you love?